The Middleborough Lodge Benevolent and Protective Order of Elks was organized in the spring of 1912. Among its very first social occasions was a ball held Wednesday, May 29. 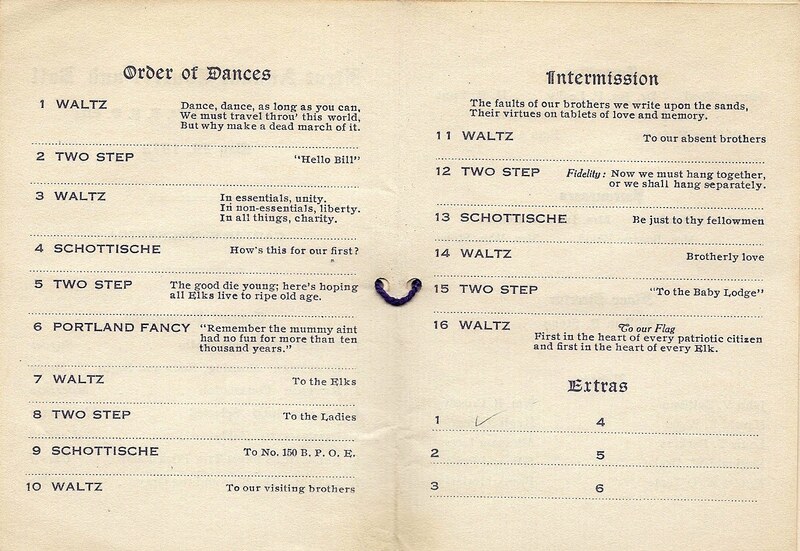 The event, which became an annual Elks' tradition, was a marked success as indicated by the following article carried by the Middleboro Gazette two days after the dance. A brilliant social event was carried through Wednesday evening when Middleboro Lodge of Elks held their first concert and ball. The decorations of the hall were a feature, the effect being white and purple, streamers being draped from the centre to the sides. The stage represented a large garden, the front decorated with American flags and an elk's head, surmounted by an illuminated clock, the hands set at the hour of eleven. Around the receiving station were small trees, representing a forest glen in which stood a life sized elk. 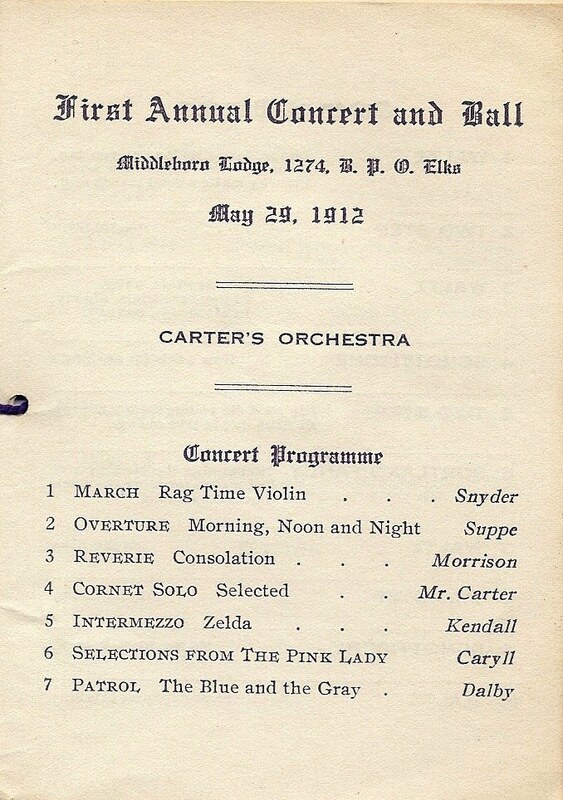 During the first of the evening an orchestra rendered a concert while the patronesses, Mrs. Bourne Wood, Mrs. Ivan Rogers, Mrs. James P. Leahy and Mrs. William F. Stone received. The ushers were John V. Sullivan, Harold S. Wood, Louis T. Perkins, Reginald Drake, Ernest M. O'Toole, William B. Crossley, Hugh Rogers, Abraham Levy, Edmund Pratt, [and] Frank Moriarty. Dancing was enjoyed until after midnight. The gowns worn by the ladies were the most brilliant and attractive of any seen recently on a local dance floor. 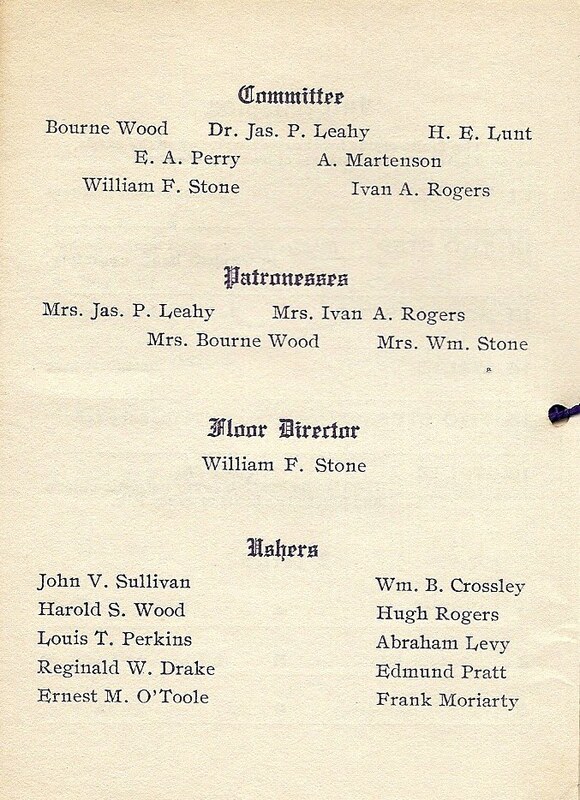 William F. Stone was in charge of the dancing and Bourne Wood, Dr. J. P. Leahy, H. E. Lunt, E. A. Perry, A. Martenson, Ivan Rogers and W. F. Stone, the committee in charge. Promptly at eleven o'clock the hall was darkened and with the Elks in a circle in the centre of the hall in front of the illuminated clock, Hon. Ambrose Kennedy of Woonsocket, speaker of the Rhode Island house of representatives, gave the eleven o'clock toast to the absent members, after which "Auld Lang Syne" was sung by the members. 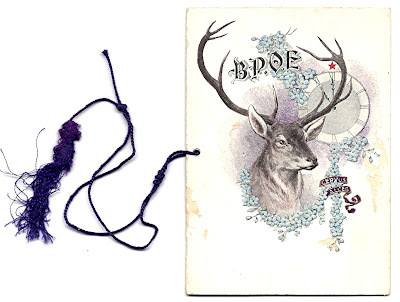 The cover of the dance card depicts an elk head with the animal's zoological name, Cervus alces, featured on the purple banner. The large clock with its hands set to eleven, and the purple and white color scheme were also reflected in the decorations for the local Elks' first ball. Dance cards such as this were noted features of formal dances of the period, and were completed by ladies who would pencil in their partners for each dance. The long purple cord on this card permitted the lady to wear it from her wrist. Mike, Great article on the Elks! As a child, I remember the beautiful mansion where the lodge was located. Do you know when that burned down? "Green how I want you green"